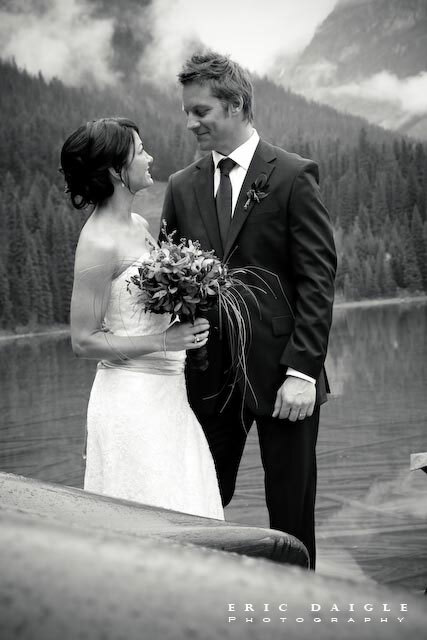 Colleen & Vince were married at the infamous Canadian Rocky Mountain Resort's Emerald Lake Lodge in Yoho National Park, October 2008. Surrounded by "luxury in the wilderness" the rain could not dampen the mood of this long awaited wedding. The weather had thwarted the ceremony being held at the viewpoint; however it took place on the balcony of Cilantro's. Not one person minded the last minute change as being in the mountains make these changes seem a bit insignificant compared to their surroundings! Our Bride had the most serene & calm look on her face as she walked with her Father toward her Groom to Harp Angel's beautiful Celtic Harp. What a moving ceremony it was. Once the ceremony had finished the guests enjoyed cocktails in Cilantro's while Vince & Colleen proceed to have their photos taken. The Pam Crawford Band of Calgary entertained the small crowd with an eclectic array of music. Dinner was arranged to take place in Cilantro much to the guests delight as there were many a "foodie" as we say in the crowd. The decor was elegant & meaningful to all who were there. 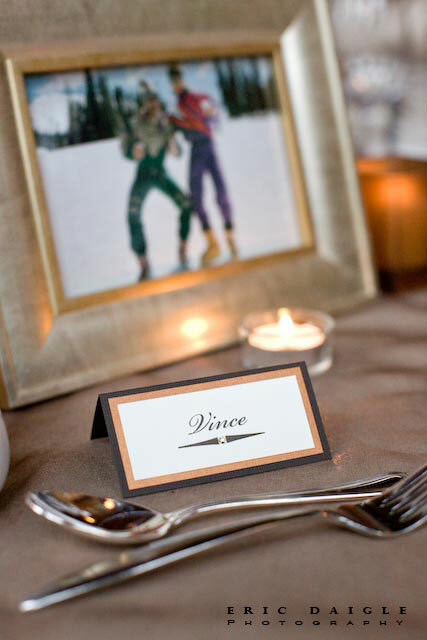 Vince & Colleen ensured there was a photo of each guest framed and incorporated as part of the centerpiece. A floral piece designed by the couple to enhance both the room & photos. The tables & chairs were dressed in luxurious linen to add to the elegance of the already beautiful room. 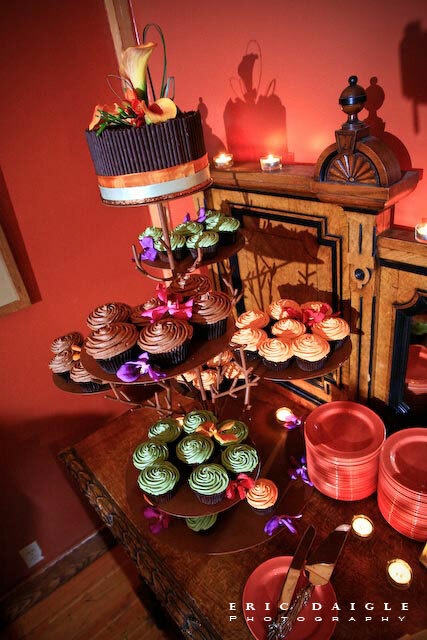 After all had danced the night away, enjoyed the late night buffet & sumptuous cupcakes by Cake Creations, I am certain they all fell into bed exhausted by the crisp mountain air & festivities. 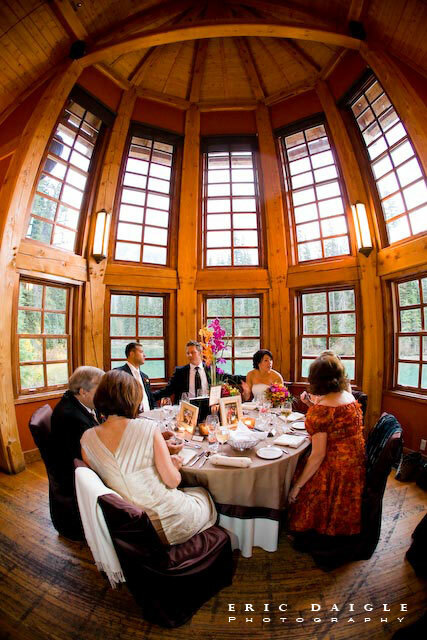 I am certainly looking forward to my next wedding at Emerald Lake as I literally came home rested & relaxed after that weekend!